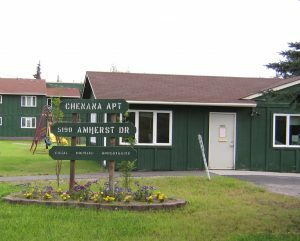 Chenana Apartments - Ben Lomond, Inc.
52 units located at 5190 Amherst Drive. Office is one story building. Access via the handicap parking. One-bedroom units are found in a secured building. The building contains five units upstairs and five units downstairs. Our units are subsidized by HUD, Housing and Urban Development-a federal government program that assists tenants with the rent. Constructed in 1977 by a family owed business that believes in building strong buildings that last can be seen in the beautiful units that continue to be improved and renovated. Exteriors are receiving a face lift with vinyl siding. New window installation was completed last year. No pets are allowed but service animals are. We do allow a small bird in a bird cage or fish in a one gallon fish bowl. Office community room is available for rental to accommodate larger family gatherings or parties.